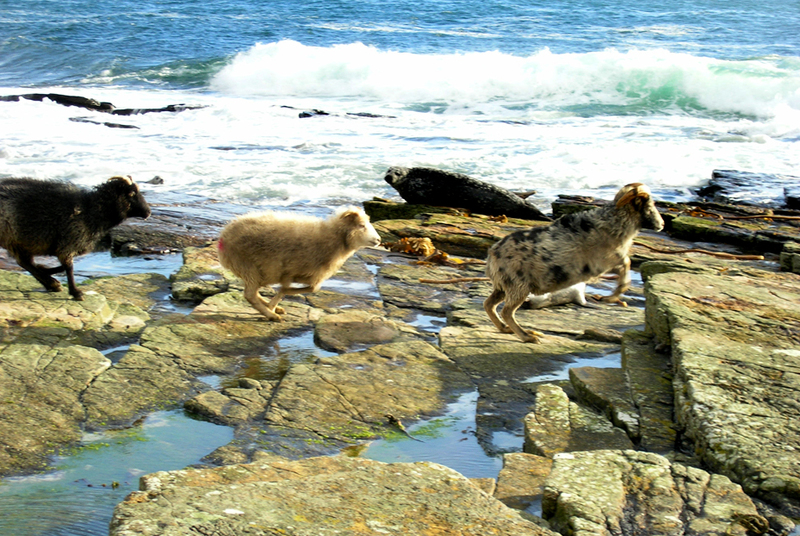 North Ronaldsay sheep belong to the family of ancient breeds known as the North European short-tailed sheep. There are over 30 different breeds in the family, spread across the north – the Iceland sheep and the Russian Romanovs, the Polish heath sheep and the Norwegian villsau. The most primitive members of the Northern European family are the Soay sheep, which are closest to the wild Moufflon sheep. It is thought that these short-tailed sheep were spread through Europe by the early farmers of the Neolithic, going back originally to around 6,000 years ago. 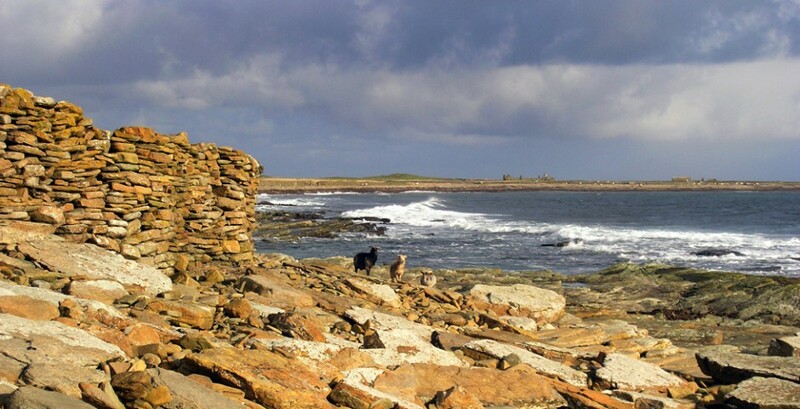 Bones of sheep similar to the North Ronaldsay type have been found at the Neolithic village of Skara Brae. Analysis of a sheep tooth from the Neolithic cairn on the Holm of Papa Westray has showed that eating seaweed goes back a long time. Marine plants, growing outwith our atmosphere, have a different intake of carbon than their counterparts on land, and analysis of carbon-13 in the tooth in a French laboratory shows that it came from marine plant material. The conclusion is that 6,000 years ago, seaweed was contributing to the winter diet of the native sheep. Sheep were among the first animals to have been domesticated by people, around 11,000 to 13,000 years ago, probably in ancient Mesopotamia. Recent genetic studies hint at a gradual route to Orkney from the Caspian region, via the Baltic, Sweden and Norway. Movements of sheep across Europe are likely to have been helped by various peak periods of trade, such as the Neolithic, the Iron Age, and the great Norse trading network of the Viking Age. By the Iron Age, the original small short-tailed sheep had been replaced by a larger variety, still with short tails but with a more uniform fleece, with variable colour. The modern long-tailed sheep came later, from southern Europe. These were much larger and mostly white. They spread widely so that by the early 19th century, short-tailed sheep remained only in remote places. After seeing the heavy modern sheep, the North Ronaldsay ones come as a contrast. The sheep are smaller and nimbler than the modern breeds, able to jump down from an overhanging rock or to tread lightly over boulders. They are expert at finding a way into places where they should not be, and there are stories about one standing beneath the sheep dyke while the others scramble over its back and the dyke top and into the grass on the other side.